The Best Machine Learning blogs from thousands of top Machine Learning blogs in our index using search and social metrics. Data will be refreshed once a week. Also check out Top Machine Learning Youtube Channels list for Top videos on Machine Learning. Machine Learning newsletter is a comprehensive summary of the day's most important blog posts and news articles from the best Machine Learning websites on the web, and delivered to your email inbox each morning. To subscribe, simply provide us with your email address. About Blog Discussions and articles on machine learning shared by the Reddit community. Facebook fans 1,215,129. Twitter followers 580,874. Mountain View, CA About Blog Comprehensive up-to-date news coverage on Machine Learning, aggregated from sources all over the world by Google News. Facebook fans n/a. Twitter followers 212,754. Melbourne, Australia About Blog Blog by Jason Brownlee. Jason started this blog because he is passionate about helping professional developers to get started and confidently apply machine learning to address complex problems. Facebook fans 30,061. Twitter followers 10,745. About Blog MIT News is dedicated to communicating to the media and the public the news and achievements of the students, faculty, staff and the greater MIT community. Facebook fans 1,113,794. Twitter followers 963,265. San Francisco, CA About Blog Practical guides on machine learning with applications and code. Latest trends in data science for professionals, as long as good old methods for beginners. Facebook fans 844. Twitter followers 749. Facebook fans 1,105. Twitter followers 3,947. Corvallis, OR About Blog Machine Learning made beautifully simple. A company-wide platform that runs in any cloud or on-premises to operationalize Machine Learning in your organization. Facebook fans 1,727. Twitter followers 4,195. About Blog We blog on artificial intelligence, machine learning, natural language processing, algorithms, libraries, and useful things. Seattle, WA About Blog Amazon Web Services (AWS) is a dynamic, growing business unit within Amazon.com. Subscribe us to get articles about machine learning from Amazon Web Services. Facebook fans 429,886. Twitter followers 1,676,332. Silicon Valley About Blog Cisco is the worldwide technology leader that has been making the Internet work. Our people, products, and partners help society securely connect and seize tomorrow's digital opportunity today. Subscribe us to get machine learning articles. Facebook fans 1,589,894. Twitter followers 646,890. Facebook fans 166,938. Twitter followers 25,988. About Blog Uber Engineering is all about building scalable systems to move people and things to the physical places they need to go. Follow to keep up with machine learning articles from Uber Engineering. Facebook fans 71,718. Twitter followers 31,377. About Blog Unity brings state-of-the-art, affordable multiplatform tools and services to developers of interactive content everywhere. Subscribe us to get articles about machine learning. Facebook fans 801,237. Twitter followers 333,565. About Blog Analytics Vidhya is a thriving community for data driven industry. This platform allows people to know more about analytics from its articles, Q&A forum, and learning paths. Facebook fans 49,664. Twitter followers 18,144. About Blog An Ergodic Walk is a blog written by Anand Sarwate, who is an Assistant Professor in the Electrical and Computer Engineering Department at the Rutgers, The State University of New Jersey. About Blog Research and development in Splendio Technologies. Crazy on AI, Chatbot, Machine Learning, AWS Solution Architect and Certified AWS DevOps Associate. Menlo Park, CA About Blog Expand your knowledge about artificial intelligence with our educational articles about AI, intelligent applications, machine intelligence and big data. Facebook fans 1,404. Twitter followers 10,165. Bangalore, Karnataka About Blog This is a technical blog, to share, encourage and educate everyone to learn new technologies. I am a Machine Learning Engineer. I have worked with several Machine learning algorithms. My past work included research on NLP, Image and Video Processing, Human Computer Interaction and I developed several algorithms in this area while working in Computer Architecture and Parallel Processing lab of Seoul National University. About Blog Distill is dedicated to clear explanations of machine learning. Subscribe us to get updates on Machine Learning. About Blog Thoughts on applied AI and machine learning. Blog by Charles H Martin, PhD. Hyderabad, India About Blog This is a blogging site where you will find posts on latest technology. Also you will find the latest news that is happening in the IT industry. Facebook fans 276. Twitter followers 27. About Blog This blog features Machine learning and learning theory research articles. About Blog Machine Learning Weekly is a hand-curated newsletter about machine learning and deep learning, curated by @alirezasmr and @datarade. Facebook fans n/a. Twitter followers 9,895. Facebook fans n/a. Twitter followers 15,860. Facebook fans n/a. Twitter followers 7,034. About Blog This is an experiment in the application of a blog to academic research in machine learning and learning theory by John Langford. Exactly where this experiment takes us and how the blog will turn out to be useful (or not) is one of those prediction problems we so dearly love in machine learning. India About Blog MieRobot is a blog on machine learning,deep learning and diy robotics.Blog includes simple roadmap which can be followed. Facebook fans 2,404. Twitter followers 490. DeepMind, London About Blog Blog by Shakir Mohamed, a Research Scientist in Statistical Machine Learning. Bayesian reasoning, variational inference, deep learning, reinforcement learning, AI. South African. Facebook fans n/a. Twitter followers 10,040. Mountain View, CA About Blog Explore the cutting-edge work Google is doing in machine learning. Facebook fans 26,766,335. Twitter followers 20,445,742. Fremont, CA About Blog HackerEarth is building the largest hub of programmers to help programmers practice and improve programming skills. Follow to get information about machine learning from HackerEarth. Facebook fans 480,146. Twitter followers 13,593. About Blog This is a blog by Niklas Donges featuring tutorials and explanations about applied Machine Learning. About Blog I’m Ando Saabas. I’m currently employed by Microsoft and work on data in the Skype team. This is a blog dedicated to general topics in applied machine learning, data mining and visualizations. Facebook fans n/a. Twitter followers 309. About Blog Datumbox blog focuses on Machine Learning, Statistics, Artificial Intelligence and their applications on Software Development and Online Marketing. Facebook fans 774. Twitter followers 756. About Blog foldl is a blog by Jon Gauthier about machine learning. Facebook fans n/a. Twitter followers 3,536. About Blog AI, machine learning, deep learning, data science and all those topics! 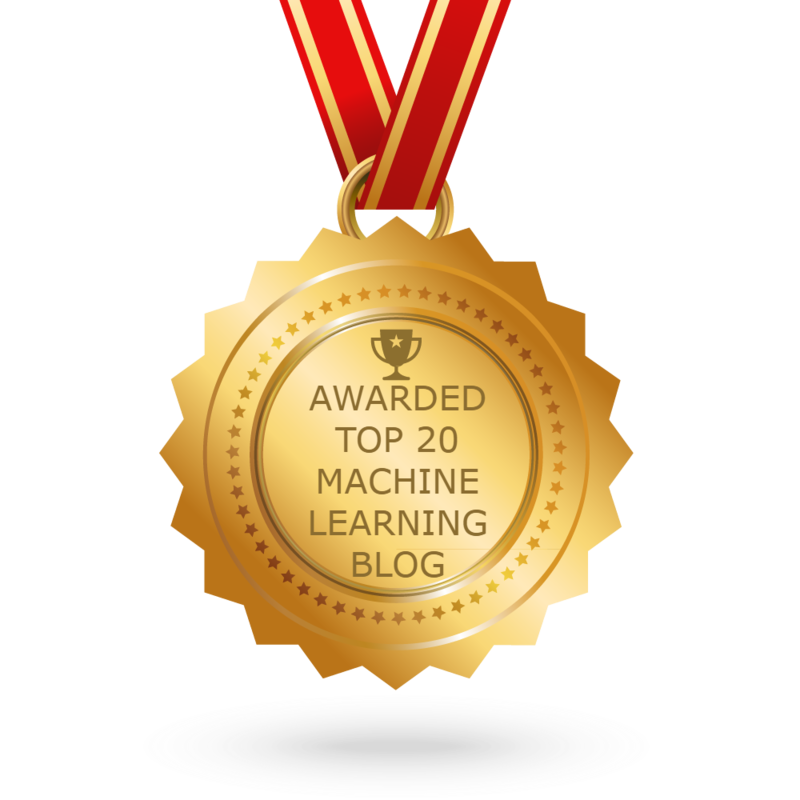 CONGRATULATIONS to every blogger that has made this Top Machine Learning blogs list! 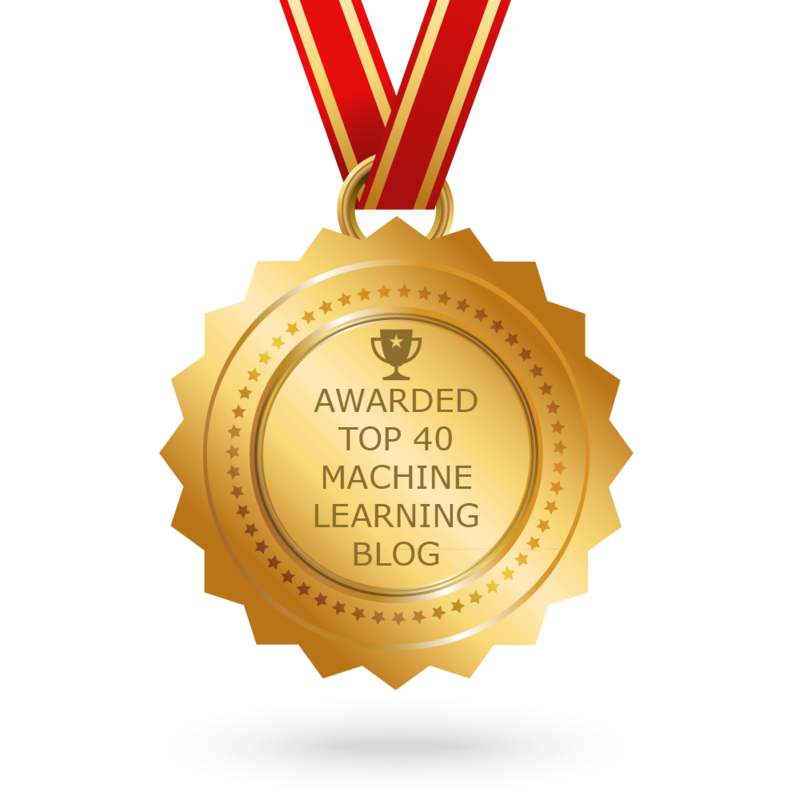 This is the most comprehensive list of best Machine Learning blogs on the internet and I’m honoured to have you as part of this! I personally give you a high-five and want to thank you for your contribution to this world.